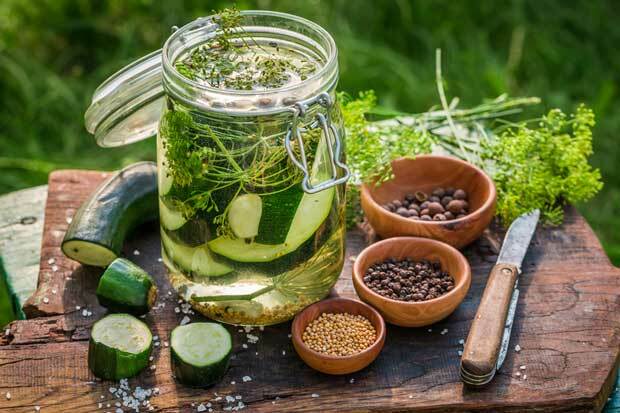 When you’re knee-deep in cucumbers and courgette, zucchini, it’s time to make a mouth-watering preserve that has stood the test of generations. Say the words ‘bread and butter pickles’ and I don’t necessarily remember the actual look of the pickles or my mother making them without fail every summer. Instead, the unforgettable combination of sugar, turmeric, mustard, and vinegar floods my senses and I am compelled to find a jar, just to have another taste of one of the most enduring preserves of my childhood. Bread and butter pickles are a standard item in my own larder, with one slight deviation from tradition (see the recipe below). It doesn’t matter whether you grow cucumbers or zucchini in your summer garden or not, there is always a big pile in the vegetable bins over summer. Many gardeners and recipients of fresh produce from the neighbours or rellies will instantly bring to mind the familiar bucket-loads of straight, curly or round cucumbers, zucchini in yellow and green, the ubiquitous marrow taking pride of place on the back step. These long green vegetables seem to magically pop out in the night. “I’m sure there weren’t any there yesterday,” I’ve heard people say, and now, suddenly, there are too many. Too many in my kitchen isn’t a problem. Too many is perfect for bread and butter pickles. But I will say that I have stretched the boundaries of what is a true bread and butter pickle due to the abundance of cucumbers and zucchini in both my own garden and as gifts from people in my local community. For years, I was religiously faithful to my mother’s recipe, only using the slightly larger pickling cucumbers that couldn’t be turned into gherkins. Then a friend introduced me to bread and butter pickled zucchinis. These had a slightly different texture but with the same refreshing crunch and flavour of the cucumber variety. I discovered that zucchini works just fine for bread and butter pickles, but I also learned to give them only a very short blast in the simmering vinegar/sugar solution or they go soggy. The rule applies for ordinary varieties of cucumber too – you don’t have to use pickling ones. The second recipe comes from another memory that relates not to taste but to ethics. The defining moment when I decided to become a vegetarian slips my mind, but it was definitely during my first two years at Waikato University and somehow related to me reading Peter Singer’s book, Animal Liberation. It came as a bit of a shock to my dairy farming parents who were accustomed to our family consuming three meat-based meals a day. I ate bacon for breakfast every day for nearly16 years. When my father heard I had converted, he shook his head, as if it to say ‘it’s just a phase’. And it was on a dietary level, lasting four years, with a foray into veganism. I got over it, as we Kiwis like to say, although I still prefer to reduce my footprint by eating predominantly meat-free meals and supplementing my diet with wild game from our local area. My mother’s reaction was very different. She took on the task of cooking vegetarian food for me with all the intensity of a Master Chef contestant. She made it her job to make sure I was getting enough protein in creative and varied ways. This kugel recipe (I know you’re thinking that it sounds heavy and violent but it’s really very light and fluffy) hailing from Poland was one of her methods of simultaneously using up huge numbers of zucchini in summer and getting protein into me in the form of eggs. It holds a special place in my ‘recipes from when I was a kid’ memory compartment and also goes down in history as one of the only recipes that I haven’t messed around with. I make it just the way it says in the book. If using cucumbers, lightly scrub them and then rinse to get the prickles off. Slice the onions and zucchini or cucumbers and toss in a large bowl or clean bucket with all of the salt. The thickness of the slices is up to you – some people like them thin, some like them thick. Leave for 3 hours, then rinse. In a large heavy-bottomed pot, add the remaining ingredients and bring to the boil, stirring so that the sugar doesn’t burn, then add the sliced, rinsed cucumbers or zucchini and simmer gently for 3-5 minutes. Spoon into sterilised jars, top up with liquid and seal. Leave for two weeks before eating. Grate the zucchini, potato, and carrot into a large bowl. Add all the other ingredients except the cheese – add half, and leave half for the topping – then mix well. Bake at 180°C for 30 minutes in a buttered, oven-proof dish, top with remaining grated cheese, then bake for a further 15 minutes until brown and crispy on top. 1. Cucumber and zucchini (or courgette) are members of the same family – the gourd family, Cucurbitaceae – but are different genera (Cucumis and Cucurbita respectively). 2. Cucumber hails from Southern Asia, but zucchini are a variety of summer squash grown in Central and South America. 3. Even though zucchini is served and often mistakenly classified as a vegetable, it’s technically a fruit because it is the swollen ovary of the zucchini flower. Cucumbers are classified as fruit for the same reason. 4. By touch, cucumbers are colder, waxy and bumpy; zucchinis tend to be rough and dry. 5. Cucumbers are usually eaten raw; zucchinis are most often cooked. 6. Zucchini flowers are edible, but cucumber flowers are not.